ASU linebacker Carl Bradford is mulling a jump to the NFL, but coach Todd Graham expects Bradford to return for his senior season. 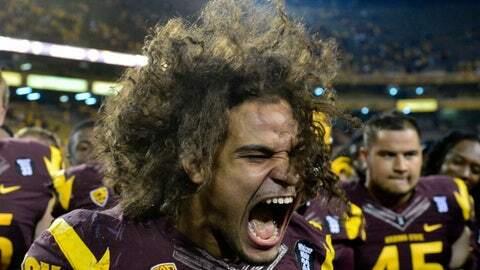 TEMPE, Ariz. — Arizona State coach Todd Graham on Thursday said he expects junior linebacker Carl Bradford to return for his senior season, though no decision has yet been made. "I fully anticipate him being back," Graham said. "That’s his decision. At the end of the day, he can do what he wants to do, but I would be shocked if he didn’t decide to come back. "Every indication he’s given me is he intends on being here." Bradford did not speak to reporters following Thursday’s practice. Graham said Bradford filed paperwork with the NFL advisory committee to receive a draft grade, but that is standard procedure. "We do that with all of our guys that are juniors and stuff like that — get them evaluated," Graham said. Bradford was a Second Team All-Pac-12 selection this season, in which he tallied 55 tackles and a team-high 18 tackles for loss. His 8.5 sacks tied for the team lead. Bradford also was honored as the team’s outstanding defensive linemen, as his hybrid Devilbacker position typically has him lined up as a defensive end. Bradford graduated earlier this week, but Graham said he believes Bradford knows there’s more he could gain from staying for his senior season. I fully anticipate him being back. That’s his decision. At the end of the day, he can do what he wants to do, but I would be shocked if he didn’t decide to come back. "I think he knows his development, his maturity, all those things are things that are going to better him to be here another eight months," Graham said. Graham said he will advise Bradford throughout the decision-making process, particularly once he receives a draft grade. Graham did the same for defensive tackle Will Sutton last season, advising the All-American to return. "Each individual is different," Graham said. "I’ve been in a situation where I’ve advised a guy he needed to (leave early)." Sutton’s decision to return paid off. He was not a consensus All-American again but he repeated as an Associated Press First Team All-American, the Pac-12 Defensive Player of the Year and the Morris Trophy winner as the conference’s top defensive lineman as voted on by Pac-12 offensive linemen. Graham said he believes Sutton’s success after deciding to return could impact Bradford’s decision this year. "You look at what Will did and how it’s benefited him — I think you’ll see that on draft day," Graham said. "Where he was projected and where he’s projected now is night and day." Sutton’s draft grade projected him as a fifth-round selection. He now is widely projected to be picked in the first or second round. Graham said he believes Bradford would benefit greatly from returning but will give the best advice he can based on the draft grade and Bradford’s best interests. "I can tell you this: I’m straight honest," Graham said. "If his grade comes back and it’s a first round (grade), we’ll have a going away party. It’s not just about what our needs are here. "We care a great deal about him, and we’re going to help him. But again, at the end of the day it’s his decision and not my decision."